Horror news site Dread Central has posted some great new images of some upcoming Gremlins figures. The figures are done by Jun Planning, however they make no mention on their website of the figures. 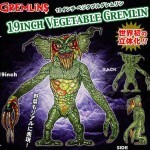 the figures feature various Gremlins from both films including Gizmo, the Vegi-Gremlin, the Bat-Gremlin and the Flasher Gremlin.